Oh what's for Breakfast? Oh what's for Breakfast? I'm posting this one for Jenn because I know how much she loves veggies! Who doesn’t love breakfast for dinner? My husband said these were the best waffles he has EVER had!! 1. Beat eggs. Add sour cream, milk, oil, and zuch. 2. In a separate bowl mix flour, baking powder, soda, salt and nuts. 3. Pour wet ingreds into the dry ones and stir just to blend. 4. Bake in a greased waffle iron. Thanks to http://www.favfamilyrecipes.com/ for this recipe, so easy and so yummy! In a bowl, beat eggs and milk. Stir in all other ingredients. Put in greased 9x13 pan and bake at 350 for 45-55 min or until well set. Serve topped with salsa." Click here for this AMAZING french toast recipe! Oh divineness! Maybe you've wondered why there is rarely a post in the breakfast section. Some typical humans are what we refer to as a "morning person". They wake up before the sun rises, often leaping out of bed with enthusiasm, in they sing in the shower because they are soooooo happy that they are done sleeping that can't keep the joy inside. They like going for early morning runs and like eating healthy things...like plain oatmeal. The only resemblance between me and these so called "morning people" is that we are trying to eat a more health conscious diet. (in case you missed the boat: you don't want to see me when I wake up in the morning. It's like morning of the living zombie). Anyway...back to the eating healthy part. So my morning head grogginess keeps me from wanting to do anything but sleep. Yet I rip myself out of bed and force myself to fix a bowl of what I have deemed to be a worthy breakfast cereal: Shredded Wheat. Isn't that stuff for "morning people"? you might say. False! 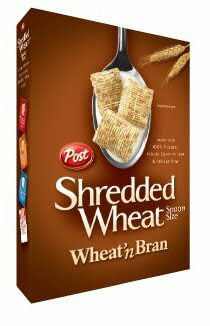 The plain hay bale-like shredded wheat eaten plain are for morning people... and your Grandma. However, there are two varities that I adore. Wheat N' Bran and Honey Nut. The Wheat N' Bran has subtle nutty flavor due to the added bran (always good), I like slicing a banana into my cereal instead of using sweeteners. And with a 1 1/4 cup serving it totally hits the spot. 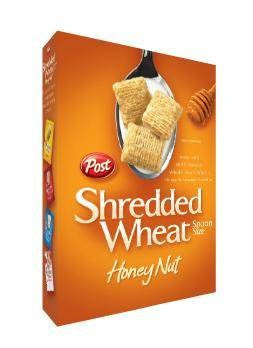 Yesterday I came across an amazing product... is the baby bear of my beloved Wheat N' Bran: Honey Nut. This creation is not too sweet, not too blah, just right. Both cereals are low in fat, and high in fiber (yay!) which means you don't have to skimp on the milk. 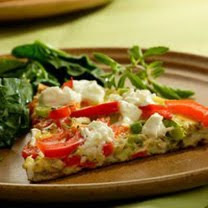 Frittatas are so versatile that you can vary the vegetables, cheeses, and herbs to your own taste. I like this combination much more than the previous one I posted. Preheat the broiler and position the rack about 8 inches form the heat source. Line a baking sheet with foil. Place the asparagus pieces lightly drizzle with olive oil and toss to coat. Broil asparagus for approximately 6 minutes or until the asparagus can easily be pierced with a fork. Set aside. In a bowl, combine the eggs, half-and-half,salt and pepper and whisk until evenly distributed, about 2 minutes. Gently stir in the goat cheese. In a 10-14 inch ovenproof frying pan, melt the butter and 1 tablespoon olive oil. When the butter foams, add the shallot and saute until softened, 2-3 minutes. Quickly layer the asparagus pieces and the tomatoes in the pan and pour the egg mixture over them. Reduce the heat to low and cook just until the eggs are set around the edges, 3-4 minutes. Using a heatproof rubber spatula, lift the edge and tip the pan so the uncooked egg runs underneath. Place the pan under a broiler and cook until the top of the frittata is set and a knife inserted into the center comes out clean, 4-5 minutes. I wandered onto the Pillsbury website the other day and found all their recipes for their bake-off finalists. Their recipes are amazing! I can only dream of creating something worthy of being in a contest. Out of all of the recipes this bread pudding popped out at me, mostly because of the little story that the recipe creator wrote up. 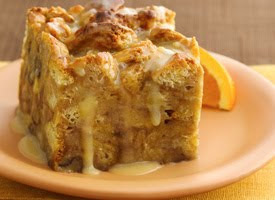 Recipe creator, Kristi Strong of West Jordan, Utah, said that she made this recipe after trying bread pudding for the first time and loved the taste, but wanted to make a bread pudding that wasn't soggy. Hallelujah! Finally someone who sees it my way! Heat oven to 400 degrees. Spray large cookie sheet with cooking spray. One cookie sheet, place rolls one inch apart. Reserve icing. Bake 8-10 minutes or until golden brown. Remove from cookie sheet to cooling rack. Cool completely, about 10 minutes. Reduce oven temperature to 350 degrees. Spray 8-inch square pan with cooking spray. Using serrated knife, cut rolls into 1/2- to 1-inch pieces; set aside. In a large bowl, mix 2 cups half and half, whole eggs, egg yolks, sugar and walnuts until well blended. Gently stir in roll pieces. Spread in pan. Bake at 350 degrees 50-55 minutes or until toothpick inserted in center comes clean and top is deep golden brown. Cool 30 minutes. Meanwhile, in 1-quart saucepan, heat icing (from both containers). ¼ cup half and half and butter over low heat, stirring occasionally, until butter is melted. Stir in vanilla. Cut warm bread pudding into 9 servings. Drizzle with sauce. Just ran across this awesome section of eatingwell.com's website. 17 pages of Breakfasts that are less than 350 calories or less. Many of them include a non-fat latte; which for me, being a non-coffee drinker, means more food for this gal's tummy with the grand total equaling out to somewhere between "exceeds expectations" and bliss! Whisk eggs, oregano, salt and pepper in a medium bowl. Heat oil in a large, ovenproof, nonstick skillet over medium heat. Add bell pepper and scallions and cook, stirring constantly, until the scallions are just wilted, 30 seconds to 1 minute. Pour the egg mixture over the vegetables and cook, lifting the edges of the frittata to allow the uncooked egg to flow underneath, until the bottom is light golden, 2 to 3 minutes. Dot the top of the frittata with cheese, transfer the pan to the oven and broil until puffy and lightly golden on top, 2 to 3 minutes. Let rest for about 3 minutes before serving. Serve hot or cold. Per serving: 179 calories; 13 g fat (4 g sat, 7 g mono); 286 mg cholesterol; 4 g carbohydrates; 11 g protein; 1 g fiber; 326 mg sodium; 200 mg potassium.